Manufacturing has always played a large part in the American economy. 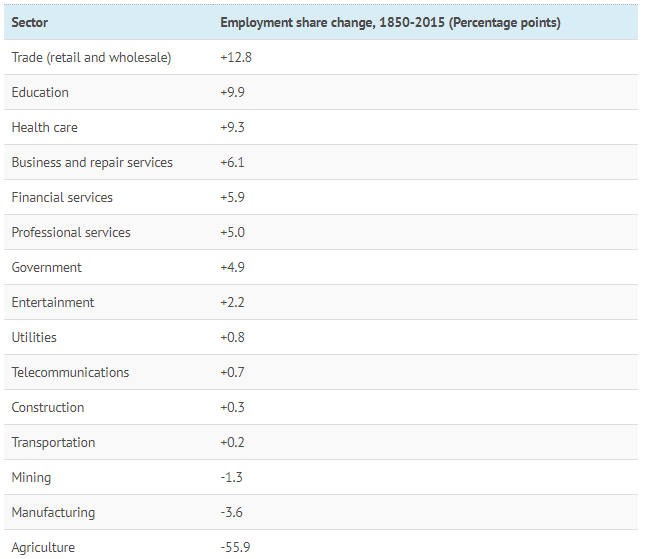 Where will tomorrow’s jobs come from? It’s a fair question, and it’s certainly one that is a hot topic of debate among experts trying to figure out the ultimate impact of AI and automation on the global economy. While no one knows the outcome for sure, what is clear is how the job distribution has changed over time: as jobs in agriculture and manufacturing have disappeared, new jobs have materialized in other sectors. 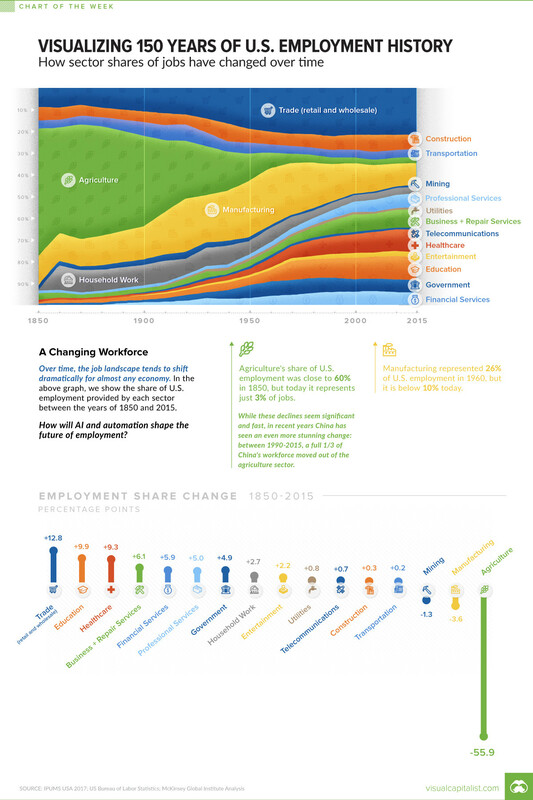 Today’s chart uses data from the McKinsey Global Institute that shows U.S. employment by sector between the years of 1850 and 2015. The agricultural sector was king in 1850, providing a whopping 60% of all U.S. employment. Much later on, in the mid-20th century, factories took the country by storm. By the year 1960, the high-flying manufacturing sector eventually peaked at a share of 26% of all American jobs. Of course, for any prospective job seeker in the modern era, it’s rare to see jobs advertised in either of these sectors. That’s because today, they add up to fewer than 13% of the total jobs that exist in the country, and it’s likely these shares will continue to decline as time passes. While the eventual impact of AI and automation on the U.S. job picture remains unclear, this above data series does provide some comfort – after all, history doesn’t always repeat, but it often rhymes. In the timeframe of 1850 to 2015, it’s clear that new technologies came in and disrupted the prevailing industries. Many jobs were lost in key sectors like manufacturing and farming, but they’ve been replaced (so far) with new jobs in other sectors. With the effects of automation expected to be felt in OECD countries by the mid-2020s, it’s likely we won’t have to wait long to see how things shake out this time around.